I’m such a sucker for names. If something just sounds amazing, I am automatically sold. I think that’s why I adore Jeni’s ice cream so much and find it totally acceptable to spend $10 on a tiny little pint of the sweet treat. The Milkiest Chocolate in the World? Goat Cheese with Red Cherries? Sweet Potato with Torched Marshmallows? Yes, yes and yes please. So this recipe! 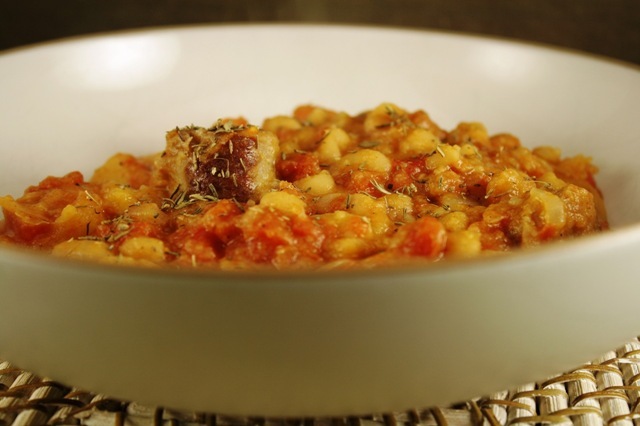 Thyme-Scented White Bean Cassoulet – I mean it just sounds delicious, no? Who’s job is it to name recipes? How do I become that person? I really do just love cassoulet, in general. The first time I tasted this beauty of a dish was about a year and a half ago and my taste buds haven’t been the same since. V1 was duck cassoulet with truffled bread crumbs and it was phenomenal. While I can’t be that fancy on a regular old weeknight, with a slow-cooker assist this version comes together pretty effortlessly. And even though in my dream life I eat truffled everything everyday, this version of cassoulet will more than do for now :). Thick, warming, a little spicy and a whole lot flavorful. Adapted from myrecipes.com for your easy enjoyment. In a large skillet over medium heat, warm 1 tablespoon of oil. Add onion, carrot, parsnip and garlic. Cover and cook for five minutes, stirring occasionally, until veg is slightly softened. Place mixture in a 5-quart slow-cooker. Add beans, broth, thyme, tomatoes and season with s&p to taste. Cover and cook on low for 8 hours or high for 4 hours until tender. About thirty minutes before cooking time is up: In a large skillet over medium-low heat, warm remaining teaspoon of oil. Add sausage and cook for a few minutes on each side until done. Mix breadcrumbs, cheese and butter in a small bowl. Add sausage and breadcrumbs to slow-cooker and stir to combine. Re-cover and cook for a few minutes longer. Sprinkle with more thyme to serve. yummmy recipe for a chilly winter-that-lasts-forever day! thanks!